Air compressor / mobile / electrically-powered / piston - C330/50 - Gentilin S.R.L. Hydraulics - Pneumatics > Compressor > Air compressor > Gentilin S.R.L. Superior performance, unmatched capabilities and docent pose an obstruction. This variant is fitted with a rack that is mounted vertically, which permits a compact base of 3 sq ft (0.28 sqm, but yet ensures a larger air reserve. The C330/50 fits easily in limited spaces and is extremely seamless to handle. Apart from other applications, it can also mated with compact blasting units. The C330/50 features the latest BOXER technology, which delivers superior performance and requires little maintenance. Additionally, this version can be used for longer work periods without overheating and can the 13.2 gal (50 L) tank can be mounted vertically mounted to reduces obstruction. Low voltage start up can be had regardless of the long cables and the oil proof pumping model does not need any tedious servicing or an oil change. 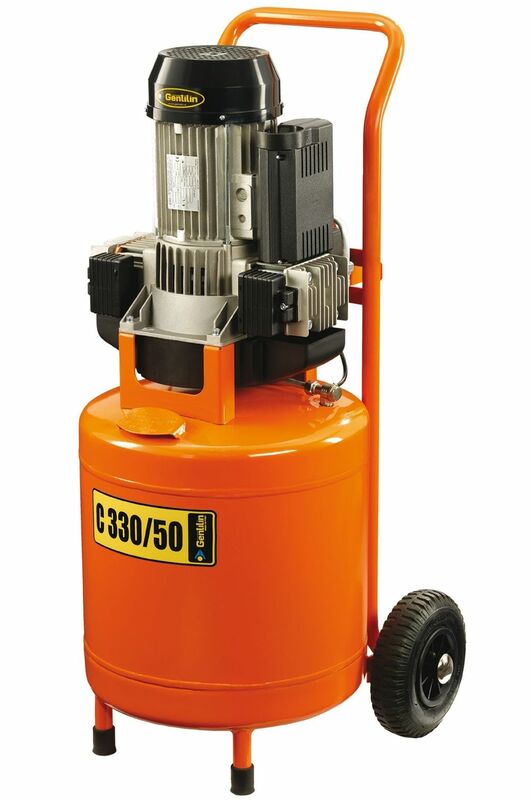 The base of the C330/50 model is equipped with large wheels, which make it easy to move and carry. One of the notable features of the C330/50 is that it ia backed by over 3000 hours of constant use. It is also able to start up below freezing level and the measures (H x L x W) an impressive 500 x 560 x 1030.